The kids having fun with playdough! Julian loves playing with Play-Doh. He often requests for it but I would hesitate whenever I think about the numerous colorful bits of Play-Doh that I have to scrape off the floor and put back into the Play-Doh cans each time he’s done playing. We now have a large collection of Play-Doh cans with colorful mixtures that are shrinking in volume. Buying new ones would provide new fun with nice clean colors but it’ll probably last only as long as the first time it’s played with before they add on to the existing collection of colorful mixtures. I decided to do it differently this time when I found a simple “no cook playdough” recipe. To start it off, I set up a little crafty corner for the kids to provide them with the space and materials they need to play and clean up. With a playdough set made up of baking accessories that came from the kitchen, we were all set to make new playdough with fresh colors! 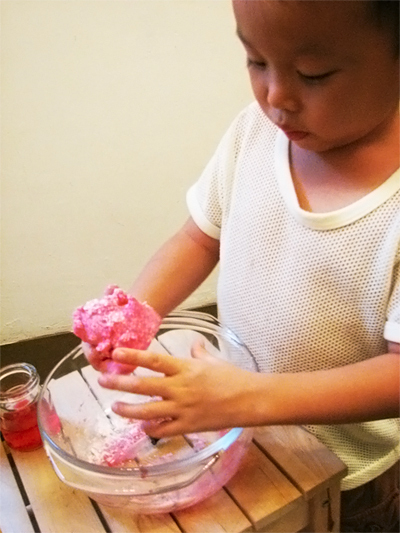 Once I prepared the ingredients into a big bowl, Julian was kept busy kneading the mixture into his very own homemade playdough. 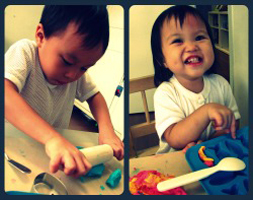 He was so fascinated with his newly created playdough that he created more with different colors while I prepared dinner! Julian kneading his homemade playdough. So here is the simple recipe for the “no cook playdough” that you can make with your kids at home, courtesy of Montessori By Hand. Simply add all the ingredients into a bowl or pot or container that is big enough for kneading and minimizing spillage. Keep the playdough in an airtight container and refrigerated when the kids are not playing it. The playdough tends to dry up after long exposure and play. When that happens, it’s time to make new ones! The kids totally engaged in their playdough creations! For our next batch of playdough, we’ll be adding glitters and beans! That should create a whole lot of sensory fun for the little fingers! If you’ve got ideas and experience to share with us, we love to read them. Meanwhile, have fun with your homemade playdough! 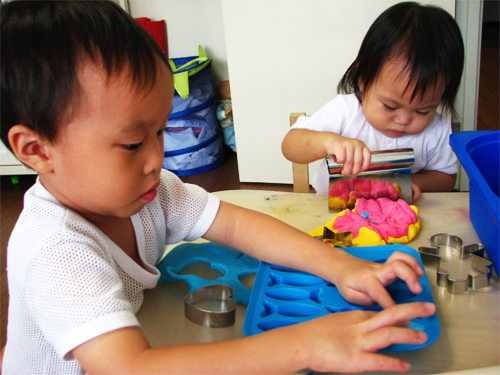 This entry was posted in Indoor Activities and tagged Crafts, Crafty Corner, Homemade Playdough, Montessori, Play, Sensory Diet on 21 May 2011 by Joan.